Began the second part of "Little Women." I can do a chapter a day, and in a month I mean to be done. 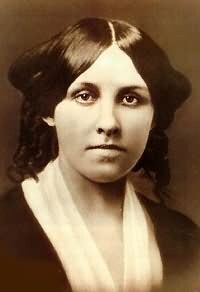 Thus wrote Louisa May Alcott in her journal for November 1, 1868. The first volume of her first novel Little Women sold immensely better than anyone expected — including the author, who had at first refused to write it. The idea came from publisher Thomas Niles, who specifically asked for a realistic book for girls. "I said I'd try," Alcott recorded in her journal. Little Women was published in October 1868, less than six months after Alcott said she'd try. It was her third book. The first print run by Roberts Brothers sold out and more printings were quickly ordered. It was called "the great literary hit of the season" and the publisher had to apologize: "the orders for [the book] continue to flow in upon us to such an extent as to make it impossible to answer them with promptness." Certainly, the success of Little Women was at least slightly similar to that of John Greenleaf Whittier's Snow-Bound: in the period after the Civil War, American readers wanted a return to happy, domestic, family life. In fact, readers demanded a happy ending and asked that all of the surviving March sisters get married — including the rambunctious main character Jo. The book was never intended to be two volumes but Alcott assented and created the character of a German professor for Jo. Her hope was that it would take a month to write. It actually took her two months, still an impressive feat. In fact, the final manuscript for the second volume of Little Women was completed only three months after the publication of volume one. From one of Alcott's letters [see http://bit.ly/sfariP], Louisa describes her writing process: "You ask what I am writing. Well, two books half done, nine stories simmering, and stacks of fairy stories moulding [sic] on the shelf. I can't do much as I have no time to get into a real good vortex." I love that image of writing intensively for a month at a time: a vortex she needed to enter!